this month, i was assigned Deanna’s blog, The Mommy Bowl + after looking through lots of tasty-looking recipes, I stumbled across Peanut Butter Chocolate Chip Bars + knew i had to make them. Deanna had adapted the recipe to be gluten-free/dairy-free, but since I don’t have those dietary restrictions (+ i already had the needed butter/flour/etc. in the house), I used the original recipe. so, how did they turn out? so flippin’ delicious. 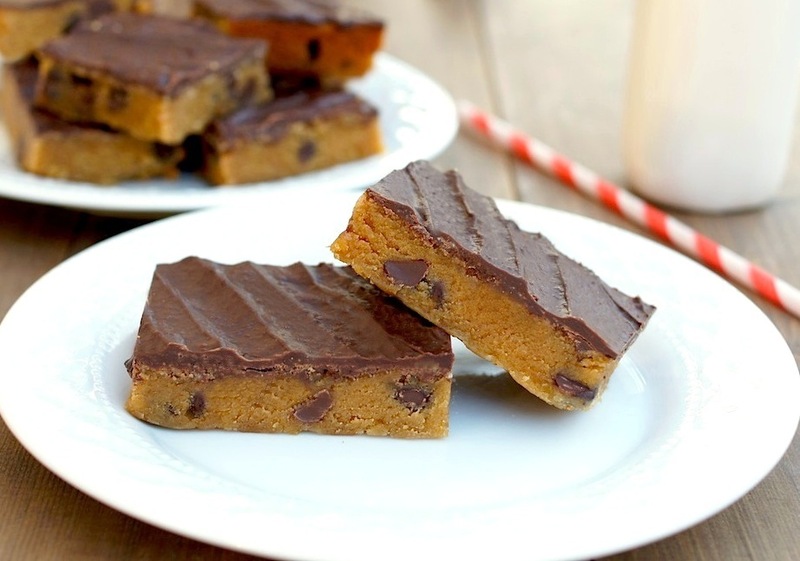 I’m a sucker for the chocolate/peanut butter combination + these bars are just wonderful – rich, creamy peanut butter bars studded with chocolate chips + topped with a delicious layer of milk chocolate. another major plus? these were SO easy to make, requiring a mere 5-10 minutes of prep before they were ready to go into the oven. so, if you’re a chocolate/peanut butter lover like I am, you’ve gotta give these a try! thank you to deanna for introducing me to these fabulous sweets, + to the secret recipe club for connecting me, yet again, with fantastic bloggers + amazing recipes! beat peanut butter + butter in large mixer bowl until smooth. beat in sugar, eggs + vanilla extract. beat in flour + salt. stir in 3/4 cup chocolate chips/morsels. spread into ungreased 13 x 9-inch baking pan. bake for 25 to 30 minutes or until edges are lightly browned. remove from oven, + sprinkle with remaining 1 cup chocolate chips/morsels. let stand for 5 minutes or until morsels are shiny + softened; spread evenly. cool completely in pan on wire rack. Wow, those look amazing! But 2 dozen bars? More like 1 for me and the rest of you good luck! I’m so happy I have everything to make it already! Peanut butter and chocolate? Your speaking my language. I don’t think I’ll ever get tired of the peanut butter and chocolate combo! These look amazing! Looks so great! I am obsessed with the PB and choco combo. peanut butter & chocolate are the most marvelous combinations together. I love that the base of this bar is peanut butter. so creamy and good!! These look so creamy and perfect. You can’t go wrong with the chocolate/peanut butter combination! Ok, I need to look away and not come back to this recipe EVER, because I’m pretty sure I’d eat the whole pan of these. These look delicious! Oh YUM! These look so good. Who can refuse chocolate + peanut butter?? Not me! Ah these do look flippin delicious! Anything with peanut butter and chocolate Thank you for sharing with me. And thank you for your sweet words on my blog. They do make my day! I hope you are having a beautiful end to your week! What a fun club! These look great, is there anything better than chocolate + peanut butter + cookies? I haven’t had any sweets for a week and haven’t really had the desire but now I really, really want these! They look SOO good! Peanut butter and chocolate. It has the power to heal. ooo I pinned these. You know, once I cleaned the droll off my keyboard. Great SRC pick. Beautiful pic. How much FUUUN! I love the sound of that club and I MUST check it out. These bars sound (and look) addicting. These look mouthwatering, Amy! Lovely recipe from Deanna! Have a great weekend. I made these brownies the day after you posted the recipe for a birthday dinner we were attending. Everyone absolutely loved them and I would bet it will lead to even more traffic to your wonderful site as all were asking about your recipe. That is so awesome, Sue – so glad you + the group loved them! I don’t think you can beat the combination of peanut butter and chocolate. Delicious! Ahhh I love peanut butter and chocolate! And can we talk about how easy these sound? I can’t get over it!! Such a classic combination that hardly ever fails.